RealChoice: Search: "How many women died from abortion in 1929"
We need some perspective first. All surgery of any sort in 1929 was done without the aid of modern blood transfusion and antibiotics. All surgery of any sort in 1929 was riskier than similar surgery today. This is the era where kitchen-table surgery was phasing out in favor of hospital-based surgery. I have an obstetrical nursing textbook from this era that describes how to set up an operating table in the woman's home to perform a c-section. So keep in mind that things that may seem appalling to us in the early 21st century -- such as performing surgery in one's home -- was not appalling at the time. Things we take for granted, like antibiotics and blood banks, were still in the future. With that said, I can't find any numbers for abortion mortality prior to 1940. It seems that before that, the information available lumps all maternal mortality together, and abortions can't be sorted out. But we can hazard a guess that the numbers were at least as high as they were in 1940. How much higher? It's hard to say. 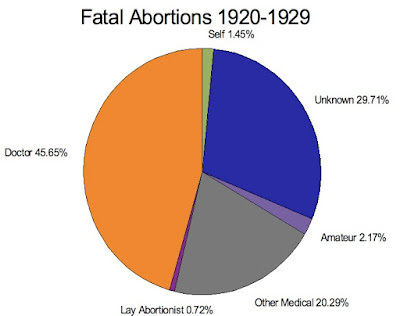 So our best guess, based on what I've been able to find, is about 1,400 deaths a year from abortions in the late 1920s and early 1930s -- a number that would combine illegal abortions, the rare "therapeutic abortion" performed as a last-ditch attempt to save a dying woman, and miscarriages. Elizabeth Palumbo -- Dr. Amante (or Amenti) Rongetti, who ran a maternity hospital that obviously also ran an abortion trade. If we figure that the least likely to die are those who get a doctor to do their abortions, and the most likely to die those who take things into their own hands, this small sample is in keeping with the estimates of Mary Calderone and Nancy Howell Lee, that about 90% of criminal abortions were done by doctors. For more abortion deaths broken down by year, see this post. Deanna, I'm sure that for any individual woman, finding a competent doctor to do the abortion will increase safety. But from a public health standpoint, removing prohibition reduces the risk to the doctor, thus also reducing his motivation to avoid causing injury. It also increases the absolute number of abortions. So, a doctor performing an illegal abortion is likely to be more careful than a doctor performing a legal one, but he will have less business than a doctor doing legal abortions. Carl Tyler of the Centers for Disease Control estimated that the rise in sheer numbers of abortions with legalization would lead to 200 additional maternal deaths per year, but also felt that this was a worthwhile price to pay for what he was sure would -- his words -- "eliminate child abuse in a single generation." Tyler was, of course, wrong about ready access to abortion eliminating child abuse. And it's impossible to tell if his prediction of additional maternal mortality was accurate or not because the CDC switched to a passive data collection system in the mid-1970s and thus no longer is making any attempt to determine how many maternal deaths are caused by abortions annually. There were far more than just a few who died from botched abortions prior to Roe v. Wade. Please get your facts straight. Can you point out anyplace I said that only "a few" women died? I believe I indicated that there were probably at least 1,400 a year prior to 1940. Do you consider this "a few"? I went to the ARHP website. It is the usual vile abortionist propaganda, full of lies distortions and fallacies. They have the usual cold-blooded lack of regard for the humanity of the unborn. They make no mention of the 50 million unborn children that they have killed. Not a very good read. Definitely not recommended. Planned Parenthood admits to live births. What kinds of jobs do Obama supporters have? You can demand "22 Weeks: The Movie"
Joe and Jessica: A foretaste of things to come? Now THAT'S what I call Gun Control! Were the Vikings really fops? Why do women die from legal abortions? Parents can't get life insurance for kid with DS. Search: "Woman dies from abortion"
1915: Who killed Anna Anderson? Nothing posting abortion clinic ads won't fix!